Yesterday, on President’s Day, I engaged in a little political action down at the State Legislature. 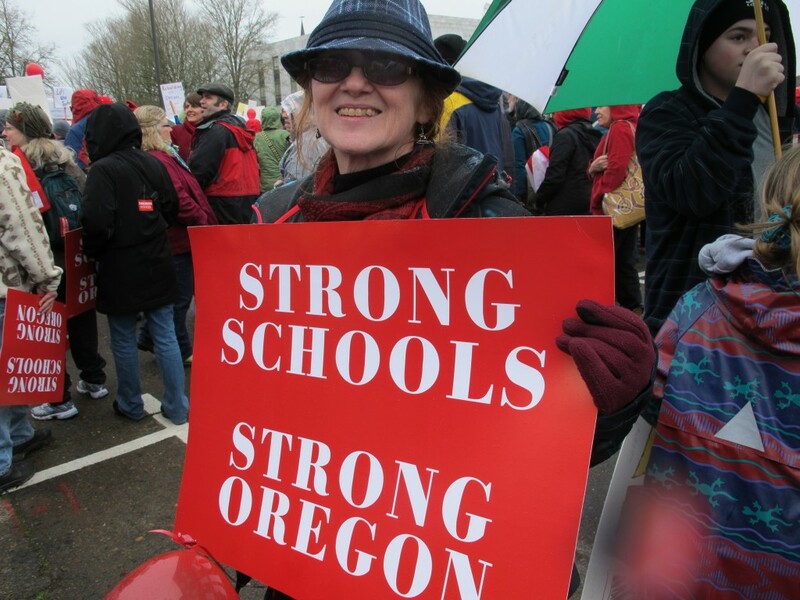 The Oregon Education Association had the mike for the big labor rally and, as vice president of my local, I had a part to play in the whole shindig…namely, show up. The steady rain didn’t set in until later in the rally. And oh yeah, we chartered a bus and rode down together–at least twenty-four of us did, complete with kiddos for some parents. As far as rallies go, it was a relatively mellow one. About 1500 or so folks showed up, not all OEA but some SEIU, AFSCME, AFL-CIO, Letter Carriers, and IBEW as well. 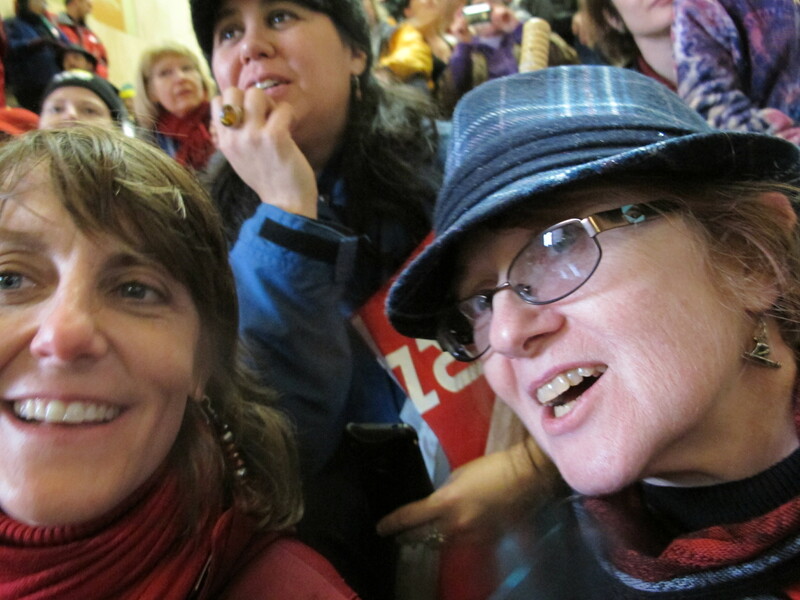 After listening to some school bands perform, a collection of speeches, and the presentation of legislators–interesting, that was, more on that later–we paraded around the Capitol, then processed into the Rotunda inside for more speeches and a couple of chants. 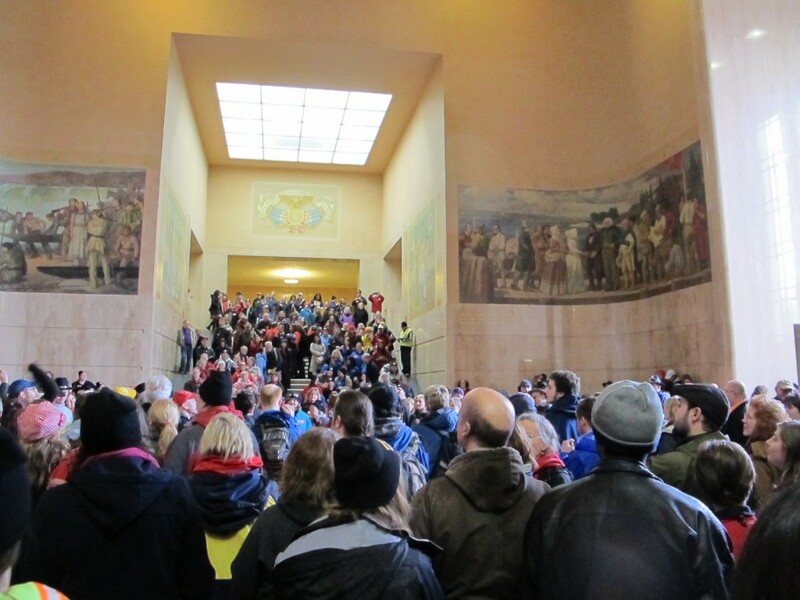 I was pleased to see that the Rotunda filled up–doesn’t happen that often but as I remember from my interning and citizen lobbying days, boy do the observers ever note the size of turnout. I commented that the Lege is well aware of turnout at events like this. Generally, lobbyists and staffers alike cluster inside the Rotunda, watching out the windows to see if this sort of rally turns out to be significant. If it’s big enough, then staffers start telling their bosses to hustle their buns out there and make an appearance. It’s part of the script. Of course, various Democratic party hopefuls for higher office appeared. But then more of the House and Senate started showing up (everyone’s in Salem for the short session). And it wasn’t just Democrats and friends of education who showed up to get introduced to the crowd “to be there.” A few Republicans stuck their heads out as well as yellow-dog Dems who don’t necessarily side with education. Significant? Oh hell yes. I talked with folks who’d gone to last year’s rally when the Lege is in regular session and there were many fewer legislators appearing. Of course, this is an election year. I expect to see some of these folks popping up at the OEA-PIE convention in a few weeks to ask for money. But still….maybe there’s a tide turning. Or maybe they’re just taking notes on who to purge. Hard to say. But it was a good group, and, despite the rain, a good rally. We had parents and kids present, no major incidents happened, and it was awfully dang nice to not have to drive I-5 on a major holiday weekend to be there. Whether this ends up counting for something or not…well, we’ll see. Tagged as politics! politics! politics!